What could be more heart warming on an icy winter’s morning than enjoying a glass of sherry and a bowl of sweet potato and bacon soup with friends? 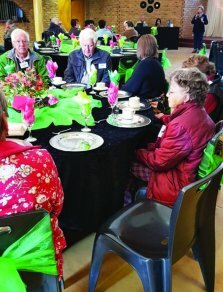 That is exactly what the Tierpoort Seniors were offered by the committee and hosts, Maryna Steyn and her daughter, Wianca Bouwer, at Royal Jontica on Garstfontein Road. 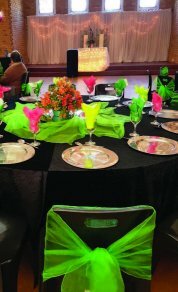 Maryna and Wianca did the festive decorations and also donated black forest cakes to enjoy with the last cup of coffee. The theme of this cold morning on 4 July was, quite appropriately, ‘Golden Oldies’. 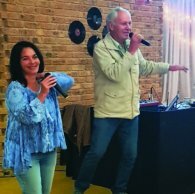 One of the Tierpoort Seniors, Freda van Staden, sponsored the guest duo, Eddie Bekker and Ronel Groenewald. 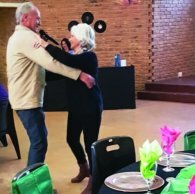 The audience enjoyed the performance and enthusiastically participated by clapping, singing and dancing to the songs from yesteryear.